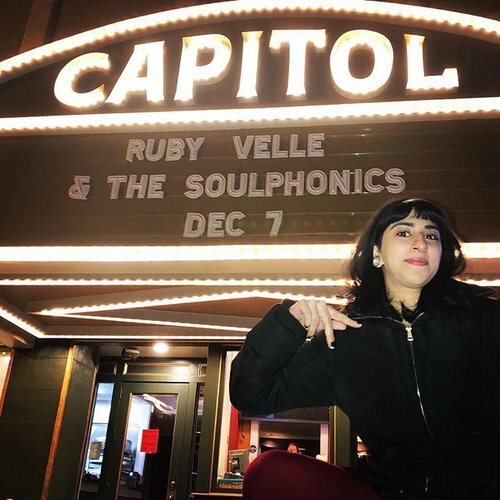 Entertaining show last night at the Hargray Capitol Theatre by Ruby Velle & the Soulphonics. This was our second time seeing them live, and this venue seemed to be more conducive to Ruby Velle’s dynamic stage presence. What a little spark plug on stage! She admits to being her own ‘merchandise girl,’ and I should have taken the opportunity, after the show, to ask her if she minds references to Amy Winehouse. Definite similarities, to me. What a shame there were only about fifty people in attendance last night. They deserved more than that. Fortunately, it did not seem to dim the musician’s enthusiasm.